How much does your company stand to lose from unanticipated repairs and the resulting losses in productivity? If, like most businesses, you count on scheduled PMs alone to prevent breakdowns, the losses could be greater than you think. Predictive maintenance based on the true conditions of assets can help save your company thousands and thousands of dollars. MPulse Condition-Based Maintenance (CBM) is a software addon that keeps tabs on the actual state of your critical assets by recording the output of any meters and gauges on that asset. When an asset’s condition changes outside of specified ranges, MPulse lets you know immediately, so you can react to prevent breakdowns before they happen. Every day your assets are trying to tell you something—are you ready to listen? 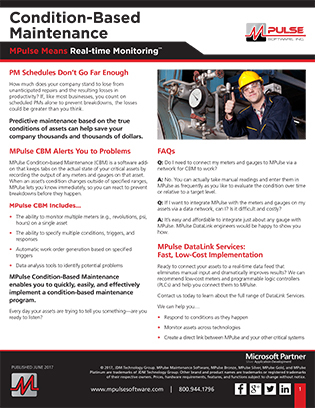 MPulse Condition-Based Maintenance enables you to quickly, easily, and effectively implement a condition-based maintenance program. Q: Do I need to connect my meters and gauges to MPulse via a network for CBM to work? A: No. You can actually take manual readings and enter them in MPulse as frequently as you like to evaluate the condition over time or relative to a target level. Q: If I want to integrate MPulse with the meters and gauges on my assets via a data network, can I? Is it difficult and costly? A: It’s easy and affordable to integrate just about any gauge with MPulse MPulse DataLink engineers would be happy to show you how. Ready to connect your assets to a real-time data feed that eliminates manual input and dramatically improves results? We can recommend low-cost meters and programmable logic controllers (PLCs) and help you connect them to MPulse.